Ireland pictures from Achill Island and Co Mayo, Ireland. These picture galleries on Achill 24/7 show photographs taken on Achill Island and surrounding areas in County Mayo on the remote west coast of Ireland. Gallery 2 features mainly pictures of mountains and seascapes on Achill Island. 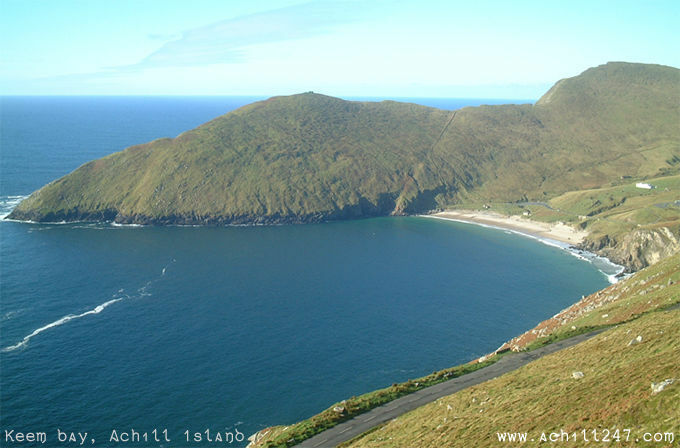 Keem Bay, a perfect horseshoe-shaped bay with a golden sandy beach, is located at the western tip of Achill Island. Keem boasts an EU Blue Flag beach at the head of a stepped valley that reaches back to Achill Head. The white building seen in this picture was formerly a coastguard station, while on top of Moyteoge (the hill in the centre of this picture) can be seen the ruins of a watch house used to sight enemy vessels off the Achill coast.